I first heard about Nancy Bishop as we were working on the same project, Walking with Dinosaurs and the English casting director had been in Prague with her previously to coming to Barcelona. I immediately ordered her book “Secrets of the Casting Couch” which I read and enjoyed and found immensely useful. I then got in touch with her to see whether she would come to give a class to actors in Barcelona. We met up in Cannes to discuss and a great friendship was born. 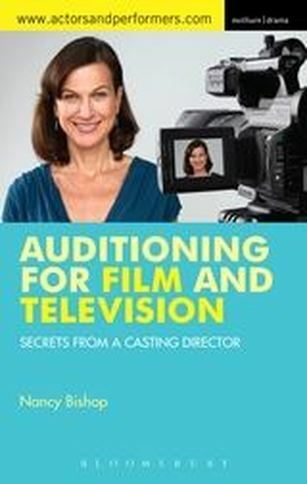 Nancy is a great casting director who has a real understanding of the process and is extremely good at getting the best out of an actor in the audition room. Her book which has just been revised and will be republished on the 9th June is packed with useful advice. How long have you been a casting director and how did you become one? I used to direct English language theatre in a Slavic country. I had a dream one night that I was walking up a hill with a bus on my head. I woke up and thought “there must be an easier way”. Theatre was a hard way to make a living, but without planning it, I was well positioned to work in film. Large scale studio productions started shooting in Prague in the mid-ninties and, since I was the artistic director of a theatre company in Prague, I knew the talent. So I started scouting local actors in Prague and this grew into an international career of casting first in Central Europe, then world-wide. Interacting with smart, creative people. We treat people like commodity. It’s just part of the job. I have to disengage emotionally from actors sometimes, which I’m not very good at. Sometimes actors think that casting directors are cold and un-empathetic towards them. We’re not naturally that way, but in order to do the job, we have to look at things objectively, which sometimes means dis-engaging. What are your three top tips for a European actor trying to kick-start his or her career? Don’t wait for the phone to ring. If you’re not working, create your own projects. Write, collaborate, produce web-series. Write a one-woman show. Keep training. Your education as an actor is never over. Master the skills you need for self-taping. Tell us a little bit about the new edition of your book? What has changed from the 1st Edition? AUDITIONING FOR FILM AND TV has a new video section in it about how to do a self-taped casing, and I have expanded my chapter on this very important skill. Also there are chapters about how to use social media to grow your career, and about how to best use IMDb. I have also specifically addressed working across borders. How to market yourself for international work.What you need to do if you want to work abroad. Etc. How can actors improve their casting skills? Take classes at Frank Stein Studio in Barcelona!